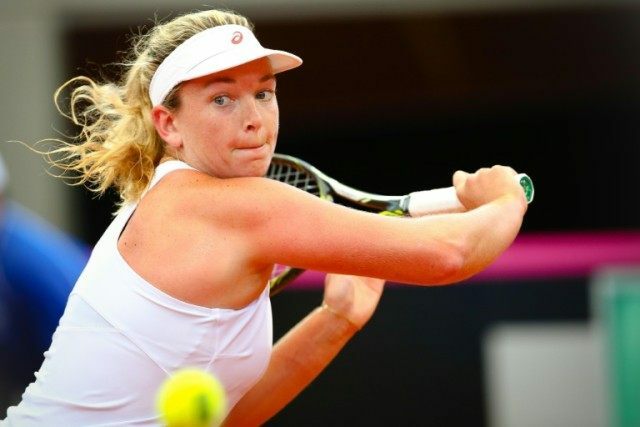 Brisbane (Australia) (AFP) – A below-strength United States booked a place in the Fed Cup World Group in 2017 when Coco Vandeweghe came from a set down to beat Australia’s Samantha Stosur on Sunday. Vandeweghe’s 2-6, 7-5, 6-4 win in the first of the reverse singles gave the Americans an unassailable 3-0 lead in their World Group play-off match on Pat Rafter Arena in Brisbane. The Americans later made it a clean sweep when Vandeweghe teamed with Bethanie Mattek-Sands to down Australian pair Daria Gavrilova and Arina Rodionova 6-1, 6-4 in the doubles. The US came to Australia without their three best players, Serena and Venus Williams, and Sloane Stephens, but won both opening singles matches on Saturday as Madison Keys downed Gavrilova and Christina McHale outlasted Stosur. US captain Mary Joe Fernandez said the American team had stepped up in the absence of the Williams sisters and Stephens. “It’s a team effort and everybody worked really hard all week with each other, supporting each other,” Fernandez said. Fernandez said it was important to give some of the lower-ranked players experience in the Fed Cup environment. “The more you put yourself in these positions, the more comfortable you get in them,” she said. However, Vandeweghe kept her nerve and, despite facing two break points when serving for the match, the American held on to win in two hours, 18 minutes and clinch the tie for the visitors. Stosur denied she had felt the pressure of leading a young and inexperienced Australian team. “I’ve been in that position for a while,” she said. “It’s not really anything new. If that’s there, you want to come through it.